Conrad Orloff has been a Strider since 2003. 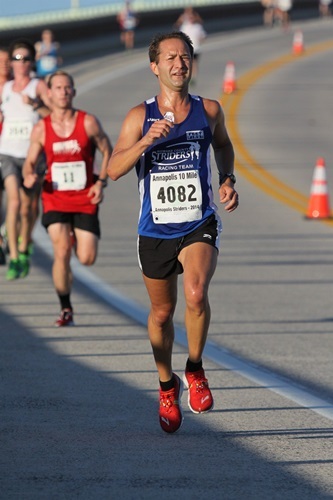 He began running at the age of 11, when he participated in his hometown’s Oak Apple run 10K. He has run cross country and track in high school and at the U.S. Naval Academy. As a submarine officer and a navy diver, he continues to race for the Navy. His most notable running achievements are: Seven sub 2:50 Boston Marathons and a 2:49 in the prestigious, but austere, Victory Marathon (Baghdad 2009). He lives in Columbia, works at the JHU Applied Physics Lab, continues to serve in the naval reserve, and is the proud father of two running girls.